Any thoughts . . . ? Last edited by LittleSkink on Wed Mar 16, 2016 12:40 pm, edited 2 times in total. Re: Just checking - a sensible enough place to start? Can I warn you about a sheet that size. Sufficiently braced and stiffened it will be a nightmare to move, particularly if you intend to stand it on end, or side. Cut it into three or four sections 1.2m long and 800 or 600mm wide then frame each one, connecting them together with coach bolts and patternmaker's/cabinetmaker's dowels. Anything eight foot by four is not portable, for a start it will only go through a domestic door lying on its long side, and going round corners could prove impossible. Stick around I guarantee you plenty of opinions and suggestions but it's the most likely arrangement to received domestic dissaproval. Contrary to what Hornby would have you believe, an 8x4 sheet is not a good place to start. It will dominate a room as you need access to both long sides- the actual space required is more like 10x8. If the layout is to be portable, an 8x4 is pretty bad. Suitably braced it will be very heavy, and won't fit through a door. A lot of people seem to get the idea that an 8x4 is a great way to build a model railway, and come looking for help. But there are much better designs. Its only advantage is that you don't have to cut the standard builders' sheet of plywood, but anyone with the skills to build a baseboard should be quite capable of using a saw. Considering the same 10x8 space you'd need for an 8x4 table, if you turn the layout 'inside out' and have the operator in the middle and track running round the edges of the room, you have a much better area available for building. The space under the layout can be used for storage shelves etc. Consider instead the space you actually have available for a layout, and design the layout to fit into it, rather than buying a big sheet of plywood and trying to find a place to put it. Once you get away from the solid table, you can usually find something more interesting that, because it can share the space, can be made semi-permanent. For example you could build an L-shaped layout in the corner, with hinged or removable sections that can complete the other two sides of a square. I'd have thought 5.5/6mm thickness as being marginal on a board that size. I use that size as my baseboard but my boards are much smaller and braced around with 9mm play and bracing underneath. If you want to stick with 8x4 cut it in half (2 4x4s) and make sure that any track over the joints are plain (and preferably straight!). Use pattern makers dowels for alignment and nuts and bolts to hold them together. Even if there will always be two of you to handle it, achieving a rigid board of that size won't be easy. The consequences of the board flexing is lengths of rail torn out of the plastic fixings on the sleepers. Go to some exhibitions have a look at how their boards are fastened together. 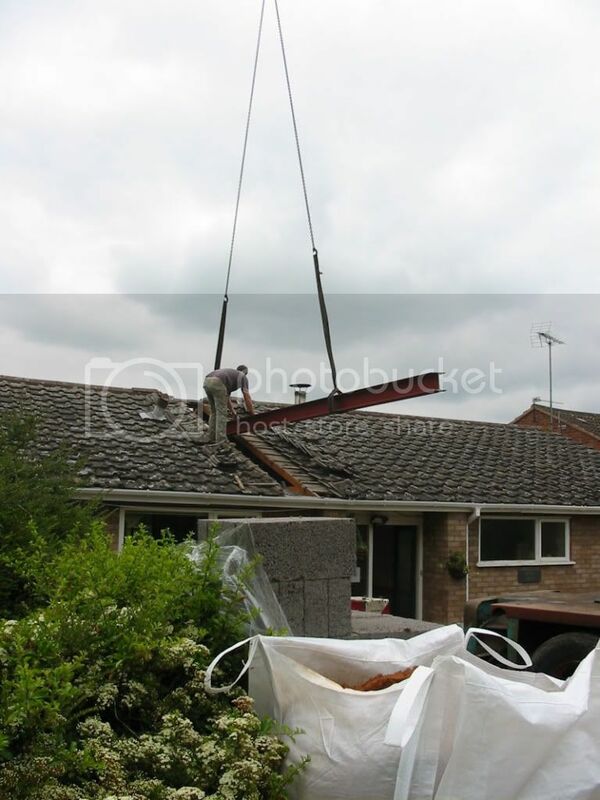 Many of the smaller ones are the equivalent of what you are proposing and their builders/operators are quite competitive when it comes to setting up times. Just watch out! Most loft entrances are 2ft square so again it won't go in. Also an 8ft length going into a loft will create it's own issues, if there is not much head height up there you won't be able to get it in! Also getting a solid board up the stairs and then through the loft opening doesn't bear thinking about... It's not the weight that's the issue, it's the bulk, with respect a canoe has the sort of shape and build which makes it easy to cart around, a solid 8x4 with track and scenery isn't. Try getting one of your single beds and try carting that around and you'll get a rough idea (and then bear in mind that the layout will be 2ft linger and 1ft wider!). Better to plan for all eventualities now than when it's finished! Yes, if the board is on a table (which is protected by a blanket) it is generally supported, and the rigidity is critical only for moving. The materials you describe are conventiona,l heading towards dated. If I had to make a movable 8x4 I'd be looking to 1" thick foil-surfaced foam (2 off 8x4) and 3.6 mm plywood (1 off, 8x4) with a target weight of 14 to 15 kg. But I admit that would be experimental: an extrapolation from smaller foam boards I've used. and knowing that I can wave around an 8x4 sheet of 1" foam held at one end (sensibly) with no threat of it breaking, little bowing, and no weight trouble..
Less extreme, but more rigid and probably weight saving would be to replace the solid timber with spaced plywood beams at least 120 mm deep for an 8ft span. The idea is in the borrowed picture below. Again, this not something obvious recommend to a first time builder, unless they have unannounced engineering or carpentry skills. Is there perhaps a local model railway club which might offer "hands on" baseboard advice? If you go as you are, and no it isn't wrong, I think you will need light X braces in plywood crossing those 2ft square sections to get a flat top surface that doesn't want to sag at the centre of each square. Re: A OO 8 x 4 - a sensible enough place to start? So far it has a double round running loop - which looks very pleasing for a passenger run - and some sidings, which seem boring . . .
Gone for "medium" points throughout, wonder if the freight would be just as happy on something smaller? Interesting variation of the "looped eight", I've not seen one like that before. My initial comments would concern clearances, between the two lines at the top (though with that configuration it's unlikely you'd have two trains alongside each other) and, more importantly, clearance between the tracks and the edge of the board. You need a minimum of 1 inch between the edge of the track and the edge of the board, preferably more, so that it's less likely to get knocked or if it does it doesn't end up dropping off the edge down to the floor and breaking! You are ok on the straight bits, it's the curves that are the issue. Any thoughts on how to enliven the freight side? To my eye, those stations with curved and non-parallel (even slightly curved) sidings appeal far more than rigid straight lines. There again perhaps you want everything to look like a Set-Track layout? The same comment applies to your main oval in that the curve is very uniform. In real-life there would be different radii transitional curves into and out of the main curve - something you can't achieve with Set-Track, but the opportunity for which presents itself naturally with Flexi-track. thanks folks. If I have accidentally created a "variation", is there a better way to create a double loop? One concern is it would be nice to run the main double loop "fast" - so I want to be sure the points/crossings are up to the job, and transitions / curves too. All the rolling stock would be modern Bachmann et al. Will it work wel or will I need to be real careful with track laying? You've got an interesting 'almost double loop' there. With DCC, it would be possible to have two trains in operation at once, though there will be a bottleneck at the station area which could actually give some interest. There could be scope for working signalling and some degree of automated control which would be good to get working. Alternatively, with two points and a short section of track leading from the lower right curve, you could complete the double loop and allow two trains to operate unhindered. You could separate freight and passenger operations by replacing the first point in the 'ladder' in the sidings for a double slip. This would allow a headshunt inside the loops, running parallel to the curve. This means a freight locomotive can shunt the sidings without blocking the main line. LittleSkink wrote: thanks folks. If I have accidentally created a "variation", is there a better way to create a double loop? I'm not sure what you want! What you have actually crated is a "looped eight" (i.e. a figure of eight turned over on itself. This is used for two purposes, firstly to get a long run in a small space and secondly to give the illusion of double track whilst only using one controller. Now the question is what you want! 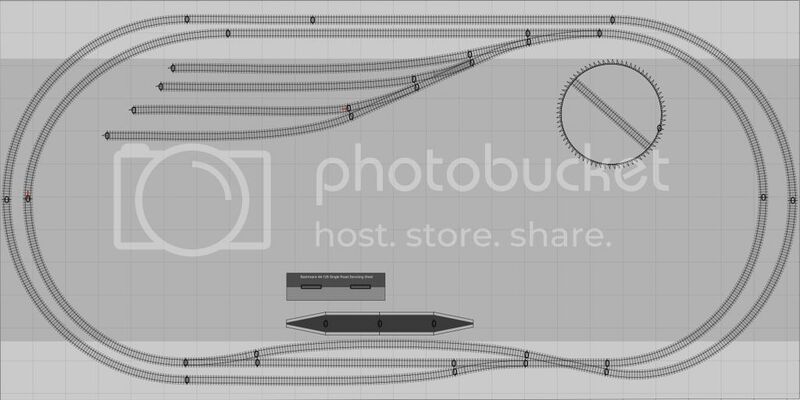 If you want a double track oval and the ability to run two trains at once without any clashes you need to get rid of that diamond crossing at the bottom right and just carry the inside and outside lines straight on. If however you are happy with one train and just want a long run then leave as is. On an 8x4 in OO scale I wouldn't worry about transition curves.